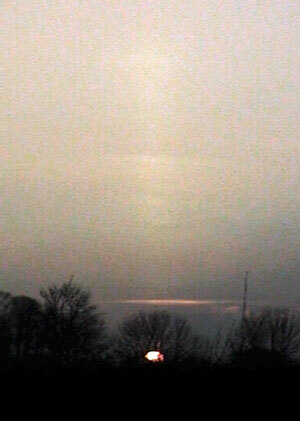 These phenomena associated with the sun are not particularly rare, but they are quite difficult to capture on film as they are not normally very prominent. There are usually caused by sunlight being refracted up into the atmosphere by layers of small ice particles just before or just after sunset. Image date, time and location: This event was witnessed at 15.44 UT on 8th December 2001 just outside Lewis in Sussex.